SORRY! Our new “Shark Bites” stamp set is sold out! THANK YOU to all the awesome shark fans! We will be ordering more and hope to have it back in stock soon. Meanwhile, we hope you will continue to celebrate shark week with us! To make up for "Shark Bites" being out of stock you can get your choice of any single 4x6 stamp set for $11.99 with coupon code: SHARK Offer valid through Sunday July 12, 2014 on new retail orders at newtonsnookdesigns.com. Valid on one item with the regular price of $14.99. Welcome to Shark Week - Day 5! Today is our LAST shark week post! Hope you have been enjoying the sharky inspiration all week long with our new Shark Bites stamp set? Today we have two more fun shark projects from Kimberly and Yukari ! 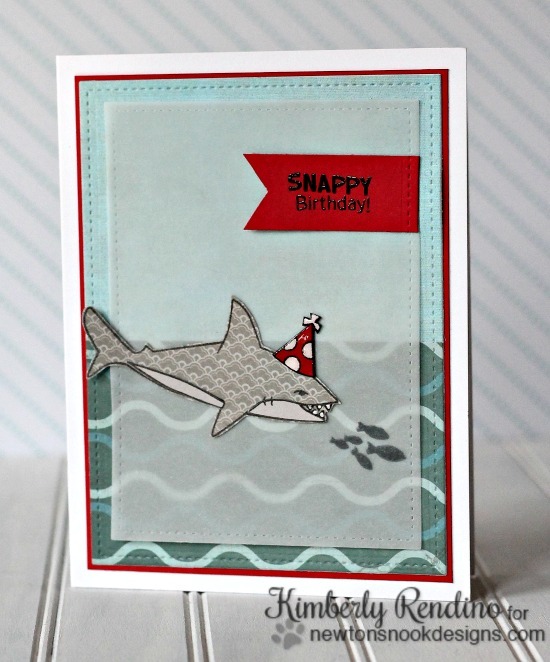 I love the cute little hat she gave the shark from our Shark Bites stamp set (she used the birthday hat from the Fetching Friendship stamp set) It's so cute how Kimberly used a subtle grey pattern paper to paper pierce the shark! Super fun! I love how Yukari used vellum to make it look like the shark from our Shark Bites stamp set is swimming along with those little fish under water! Such a fun idea! And the embossed "you're JAW-some!" sentiment on the top really gives it a fun finished touch! Hope you enjoyed our Shark WEEK! Today is the last Shark Week post but don't worry - there's more fun coming next week! Make sure you come back to see the rest of our awesome July release and our 2 year anniversary celebration! SO cute!! Love em both! :) Such a fun set.